It all started with Harriet the Spy. Harriet, the eleven-year-old girl who aspired to be a writer and who carried a composition notebook everywhere she went, was my first—and really my only—female literary hero. I can’t begin to guess how many times I read that book. I must find out why Mom has been acting so strange lately. Think about this. Yep, I really wrote that. My very first “journal” entry. By the time I hit the sixth or seventh grade, it had become more like a diary than a journal (I realize they’re technically synonymous, but I’ve always thought of a diary as being more mundane and personal, and a journal as containing somewhat larger thoughts and ideas). The pages of those early books chronicle a seemingly endless series of teenage crushes and heartbreaks, which continued fairly relentlessly until I married and had children. Then, not surprisingly, the entries begin to tell of adventures in parenting; and later still, they focus on the adventures of a divorced and financially-strapped mom of three trying to make it through college and then grad school. All in all, those early diaries comprise an unremarkable narrative of day-to-day life—a narrative likely to be of little interest to anyone but me. The entries, rarely remotely insightful, are comprised almost entirely of poorly organized, uncrafted stream-of-consciousness. The first page of the last book starts out with “an attempt to clarify—both for myself and for [a friend]—how I see agency, personal definition, and the ‘victimization’ of women as well as our subjugation.” Quite a stretch from the opening lines of the first book, but after all, they’re separated by twenty-five years. In any event, that was the last book. After that, I switched to a computer. And with that switch came a gradual shift in approach, from diary to journal, though most of what I wrote in the transitional period from 2000 to 2005 was lost, first in a switch from Mac to PC and then to the blue screen of death. In the past ten years or so, my jottings have become almost purely a writer’s journal. What I mostly find myself writing about these days are characters, plot lines, and possible scenes and themes, though at times, the mundane and the philosophical both still find their way in. Forty-five years I’ve been doing this now. None of what I’ve written in my journals has ever been meant for anyone’s eyes but my own. Yet I continue to write my entries whenever the mood strikes me—if not daily, at least frequently. I’ve only recently learned that there’s a name—that is, a clinical diagnosis—for the obsession to write: Hypergraphia. I’m not sure where one draws the line between merely loving and even needing to write and being hypergraphic, but I do know that if writing is an illness, then I guess I have it. But if I do, I’m in good company. Dostoevsky, van Gogh, Lewis Carroll, and Robert Burns are all reported to have had hypergraphia as well. Hi Melinda – just reading back through some A to Zs since I met you “too late”. I started and stopped journals all my life. I don’t know why I don’t keep up with any if them; it’s a shame because I learn so much by re-reading the detais I dud keep, and some undocumented years have disappeared from memory without journals. No, I hadn’t seen your J entry until now–I just read it and loved it. Smiled all the way through your Christmas memory. I cringe at the idea of my descendants reading my handwritten journals–I think transcribing them (and EDITING them) and having them bound is a brilliant idea. I’m getting to an age where I’m either going to have to do that soon or burn them. LOL! Yea mine need some redacting as well before they get “handed down”. I was so excited when I saw this topic! Congrats on reaching that point! –But wow, how do you keep track of different journals for different purposes? It was all I could do to keep track of only one at a time. I never worried much about anyone reading my stuff, though–I’m an only child, so growing up, I never had to worry about nosy siblings, and my mom was too busy to give it a second thought. As an adult, I’ve kept them safe, but I still rarely worry about anyone reading them. I suspect they’d get bored pretty quick anyway! I am really enjoying your A-Z stories. My stepdaughter talked about writing every day last month but I don’t think she got much beyond Facebook journaling. I have kept journals on and off over the years. Some I got rid of because I didn’t want other people reading them, some I still have buried in a box or at the bottom of a trunk somewhere. I don’t feel compelled to write so I will probably never be a writer even though I love losing myself in other people’s alternate universes. Blog on!!! Thanks for the visit, Lorna! I know how you feel about getting rid of some of them–but I just can’t bring myself to do that. That’s because I’m a pack rat! Glad you’re enjoying these–I’m having fun, too! I think that is an illness I am just fine with having. For the letter D, I wrote about my journals. 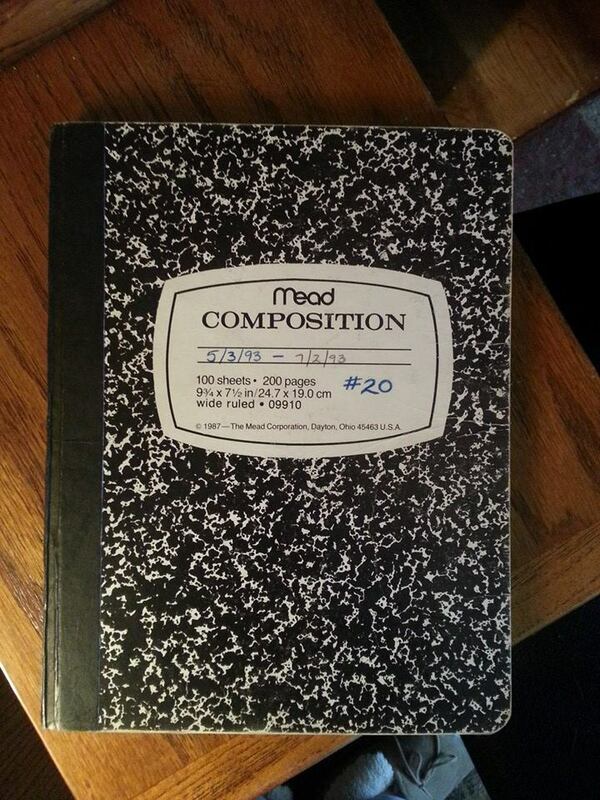 I use composition books as well. They are the only ones I ever use for my journals, and I have a very strange addiction to them .I still have at least five more sitting on the shelf for me to choose from when I finish my latest journal. OK, truth time–I have a few others, too (they make some really pretty ones now), but I just never seem to write in them anymore. It’s just so much easier to open a word doc–but I find that I write differently depending on whether I’m handwriting or typing, so I really should do both! Thanks for visiting!